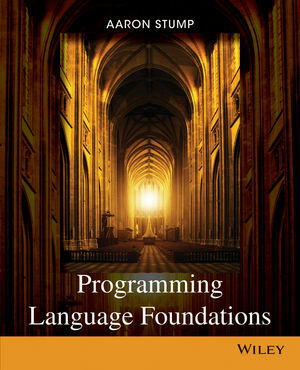 Programming Language Foundations is a concise text that covers a wide range of topics in the mathematical semantics of programming languages, for readers without prior advanced background in programming languages theory. The goal of the book is to provide rigorous but accessible coverage of essential topics in the theory of programming languages. Stump’s Programming Language Foundations is intended primarily for a graduate-level course in programming languages theory which is standard in graduate-level CS curricula. It may also be used in undergraduate programming theory courses but ONLY where students have a strong mathematical preparation. Aaron Stump is an associate professor of Computer Science at The University of Iowa. ?He received his bachelor's degree from Cornell University in Philosophy and Computer Science in 1997, and his doctoral degree from Stanford University in Computer Science in 2002.?His research interests are in computational logic and foundations of programming languages. He has served as associate editor of the ACM Transactions on Programming Languages and Systems, and on the steering committees of the International Conference on Automated Deduction (CADE) and Rewriting Techniques and Applications (RTA). ?His research has been supported by grants from the National Science Foundation, including a CAREER award. The market lacks a single adequate textbook that is up to date. Most courses at the graduate level use a combination of textbooks and other course materials. Stump concisely and completely covers the targeted syllabus, and is enriched with interesting optional chapters on related topics.